I had never seen this type of rock before, but anyone who knows me knows that I am smitten by rocks—much to my husband’s dismay. Every time we move he has this big fit over hauling around my rock collection. And uh, well, we’ve moved eight times in twelve years, so I guess he has a point. He waited, arms crossed, giving me that cute boyish grin and knowing look as he listened to me explain my latest God-moment…that included collecting rocks for the past half hour. 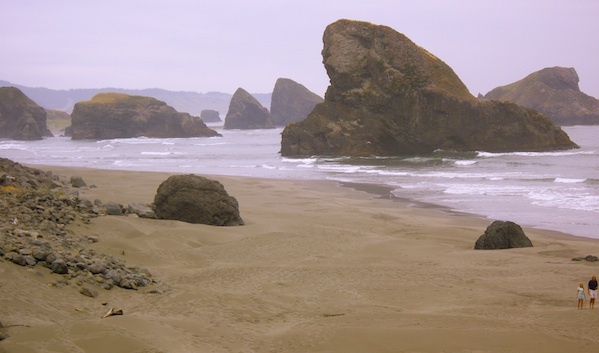 The Oregon beach where we found the stones. I showed him the larger, black and white, unshapely rocks with their holes, cracks, and flaws. And then showed him how, the smallest rocks that had been worn by the refining effects of the surf, were the only rocks that were perfectly shaped and white. Then I told him about the verse that came to my mind when I first noticed the rocks. “He who has an ear, let him hear what the Spirit says to the called out ones. That morning I meditated on the stunning truth that, no matter how broken, marred, or misshapen our lives, this truth is for everyone. Every person is being called out in his or her own timing to be shaped, refined, and polished from the old into the new. Before the end of the Story, every person will experience an unveiled encounter with hidden manna (Jesus), every person will learn to overcome, and every person will be given a white stone with a new name. What a marvelous, mysterious, happy thought. 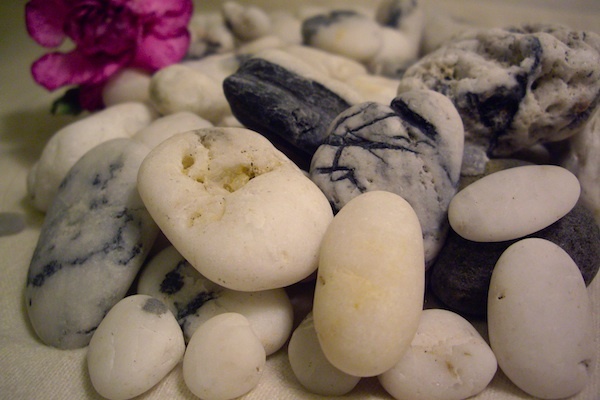 This is what I shared with my husband on the beach…this is what had been materializing in my heart that morning as I first noticed and then began collecting heaps of white and black stones. That’s all it took. My husband eagerly grabbed another plastic bag out of my knapsack and began helping me collect another 500 pounds of rocks to bring home. 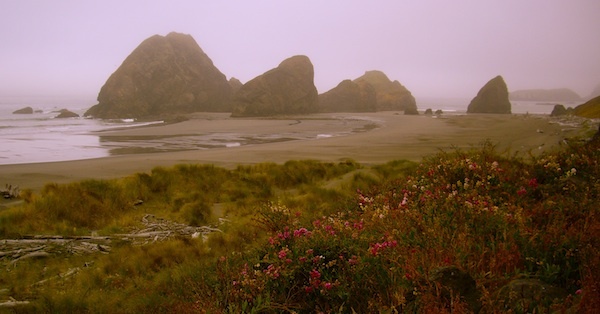 That Oregon beach is positively stunning & dream-like. I love the truth that you pulled from your rock experience. Interesting, you wrote, "before the end of the Story…" I've been wondering about beginnings and endings lately. Do you think there will be an end to the Story? Or will there just be more chapters? You might be right…after the 8th day, there is a 9th day, and so on. Maybe the plan of the ages just continues on. Have a wonderful day! So add this to your thoughts, how many thousands of years did it take him to cleanse those stones white? We as humans fail to see it is a on going process, one that will go on for many, many years. 1 Corinthians 15:22-23 says something similar: As in Adam, all die, so in Christ, all will be made alive, but each in his own order (or class)." Which no one knows…but he who receives it. powerful words… some people don't understand yet, because they haven't been made aware. Bring your coat! We were there in August and we were freezing! It is so beautiful though…there is nothing like taking highway 1 all the way down the coast. It's so unspoiled–just miles and miles of gorgeous views. Thanks for sharing this, Julie! I was just thinking about stones this morning. But my study took me to Joshua 4, where the Israelites took 12 stones from the Jordan as they crossed over to their promised land: “… these stones shall be for a memorial unto the children of Israel for ever” (Josh. 4:7). So, I’m collecting a few stones myself! Keep writing, Julie!!! That shaping and refining can be difficult for the moment, but what a wonderful ending to look forward to. In the meantime, back to rock polishing in our lives!! I never new you moved so much.. You sound like me. I have moved but I have a sports card collection. :) Love you no matter how many times you move or how many rocks you lose.. :) You will always be my Julie! That is good news because I can't seem to help myself. As to our relationship…just consider it an official adoption Jen. Love you!